It's that time of year again!- back to school! For most of us that can mean a lot of different things: the excitement, the loneliness, the preparing, ans the learning itself. But for Laura Numeroff's main character it is an opportunity for more silly antics. Join this fun as you read it to your favorite student OR better yet, how about giving it as a "back to school" gift? 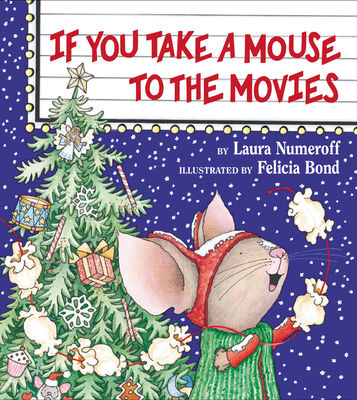 Mouse celebrates the holidays in this picture book in the beloved #1 New York Times bestselling If You Give... series! If you take a mouse to the movies, he'll ask you for some popcorn. If you give him the popcorn, he'll want to string it all together. Then he'll want to hang it on a Christmas tree. The famous little mouse from If You Give a Mouse a Cookie that has delighted millions of readers is back in an irresistible tale full of holiday antics. Collect all the books in this giggle-inspiring classic series! Laura Numeroff is the New York Times bestselling author of many books for young readers in addition to the If You Give…series, including The Chicken Sisters and Laura Numeroff’s 10-Step Guide to Living with Your Monster. She lives in Los Angeles, California, and is involved with several children’s charities, including First Book. You can visit her online at www.lauranumeroff.com. Felicia Bond is both writer and illustrator of Tumble Bumble, The Day It Rained Hearts, the Poinsettia books, and many others. She painted the art for numerous other award-winning books, including those in the much loved If You Give . . . series and the contemporary classic Big Red Barn. She lived for many years in New York and currently lives in Santa Fe, New Mexico.